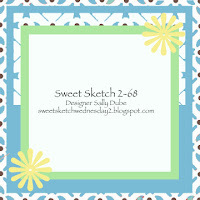 one happy little crafter: Just because......I enjoy a sketch! Hello there, hope you're having a good day....such a wet, gloomy day here in Kent and I now fear that I may have to decommission my beloved flip-flops until next summer. After a bit if DT work, I did a bit of blog browsing and landed on todays Sweet Sketch Wednesday sketch, and couldn't resist.......this is the results.....I'm doing a lot of blue and beige at the moment, a bit of a favourite, colour combi wise. wooden embellies purchased at a craft show, can't remember the name of the supplier which is sooo annoying 'cos I want some more!!! enjoy the rest of your day.....I'm off to tackle that ironing! This is gorgeous Lisa such a sweet image and I love the colour scheme - a favourite of mine too! Adorable, sweet, and absolutely fantastic!!!! I too love blue and brown together. Darling image too. Thanks for joining us at Sweet Sketch Wednesday 2. Lisa this is such a pretty card, just adore your colour combo and this sweet image from LOTV and I'm loving all your added embellishments totally perfect for your sweet card. Great card and thanks so much for sharing your talent with us over at Sweet Sketch Wednesday 2 and good luck. Beautiful card, love this LOTV image and your papers really make it pop. Ilike the kraft with the pale blue too. Thank you for choosing to create with us this week. So glad it rained and you made this beautiful card! Don't go mad on the flattening!! SO very pretty, love the blue and brown such good colours together. I love this sketch- and all the lovely layers. Thank you for sharing with us at Penny's Paper-Crafty Challenge.